Notice the use of contrasting timbers – not only the ash and walnut; but also, the different shades within the grain of the ash. All legs and rails are also curved. Clearly, I’m trying to retain some of the curved features. All legs are curved in a similar way to the front legs on the chair. 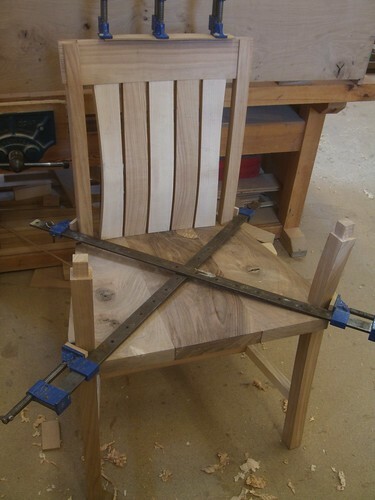 It would’ve been interesting if all legs were set at a 45° angle but then, I’d have the problem of 45° shoulder cuts and mortises – along with all that shaping! Dimensions aren’t critical at this stage but I think the proportions are almost right… Maybe it’s a little too tall? I think the stretchers would be necessary if I am to two of the four sides ‘open’ with no interior framework. Should I try and fit a shelf in somewhere? It is looking very Arts & Crafts like this (I am a fan of that style of furniture). 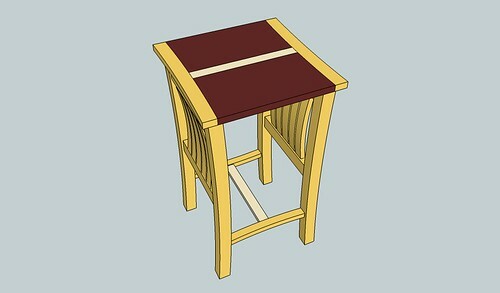 How I decide to do the top could be crucial as to how well this table blends in with the chair design. So far, there’s not a hint of English walnut anywhere and I don’t have many 2in offcuts left either. There should be enough to do some book-matching; maybe even veneering to some MDF – now that I have the bandsaw to handle such a task!! 😉 I think it needs to remain square. Tapering it or creating any other kind of shape to match the seat might look odd, if someone was viewing this piece as a potential free-standing unit (and not as part of a set or collection). Also, it may complicate some of the construction details (angled tenon shoulders, again). This would present a strong case for slicing a few walnut veneers, with the risks associated expansion and contraction, where the grain runs perpendicular to the edge lippings. I think it could work and it would certainly be more appealing than a boring ash top! I’d like to get the design sorted this month, so that I can start roughing out the timber at college before bringing it all home to work on through June (course finishes at the end of June). Most of the ash I have left now is fairly pale and comes from that area between the sap and heartwood… So, for the sake of not wasting good wood, I may also decide to stain a few bits so they blend in with the heartwood used on the chair (there wasn’t much usable heartwood left over, due to splitting). I like the initial design with the slats echoing those of the chair. 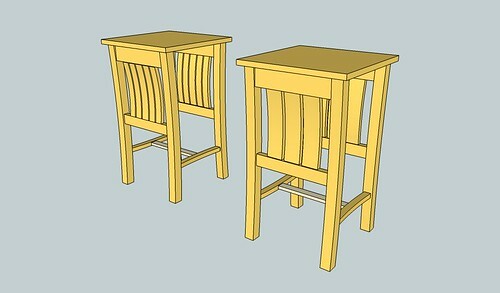 It appears that you are using Sketchup for your models. I often use the golden ratio function for proportioning the overall width and height of my furniture. If you do not have the golden ratio snaps, it is simply 1.618:1. I believe it is also known as the divine proportion. Try setting the overall height to 162% of the width, and it should be hard to fault the proportions. When you are discussing your work you will have some ancient design history to share. 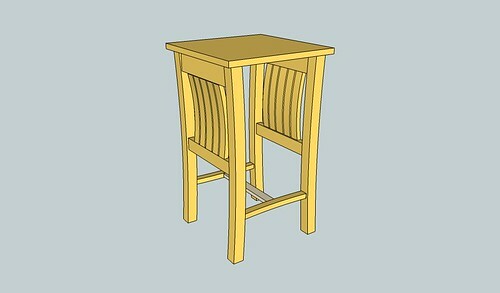 I find SketchUp is excellent for things like this, once you’ve got the hang of all the basics. I don’t use it all the time but, when you want to discuss something online (like this) it’s ideal. It’s often easier than making a full size mock up, too!! 😀 The proportions could probably do with a little work so, I will give the Golden Ratio a try later. I usually just look at the dimensions of existing pieces and use them as a guide (assuming they ‘work’ alright).